She was kind enough to provide lots of pictures so please be sure to read to the bottom of the post to see all of them. I'm inspired by so many things -- fashion history, architecture, objets d'art, furniture design… And the origin of some of my pieces can be found in childhood craft experiences such as making garlands or woven mats. I'm constantly clipping out or scanning images. I love brainstorming and sketching. I hardly like to end this initial creative phase and get down to business, but alas, I must. Then I move on to the experimentation and problem-solving phase. Many pieces begin with a stitch that intrigues me and try to see how it can be manipulated, enhanced for a significant impact. Sometimes it is a yarn and a special quality it possesses and finding a structure is going to play this up and take it to new performance limits. Ultimately what inspires me, propels me on, is the creative process. It is a kind of blissful torture and forming the object is what brings resolution and peace. Usually the one I’m working with at any given moment--I love cables, short rows, knitting in the round, knitting on bias or counterpanes … right now I have been working on a lot of lace and fallen so in love with lace that it is hard to knit anything else. I noticed you have some great commentary on the sizing issue. The magazines and publishers have responded to consumers demand and are requiring designers to submit patterns with greater size range—preferably 7 sizes. For magazines and my pattern line I use a dress form to get the best fit for the sample sweater. [For books I sometimes have a particular person in mind as I use many of my friends of all sizes as real people models.] My dress form is garment industry standard size US 8 which is actually more like the US 6 of today. [Ideally the photo shoot should have a size 6-8 model but often the models at the shoot are size 2-4 and do not fill out the bust of my sample as well as my mannequin.] This sample size used to be called the medium but the industry now calls this the small and the medium is a size US 10/12. So from this sample size I grade down 1 or 2 sizes and up 4 sizes. I try my best to keep the same proportion of the design, but some pieces that have wide stitch repeats can only get intermediary sizes by breaking up repeats or changing needle sizes or a combination and make incorporating many sizes into a pattern really difficult. Also bodies differ to such a degree that there is no guarantee that scaling up is going to really accommodate the specific needs of that person’s figure. None of it is an exact science. Also there is so much incorrect gauge and yarn substitution going on and this throws a wrench into the whole thing—the fabric may have a totally different stretch and drape. I think the best thing a knitter can do is do what seamstresses do—have a personalized dress form and understand how to make adjustments that will customize a sweater. And to get to know how garments with different fabrics and different amounts of ease work on them. I like to see what other designers are doing. I feel that the very best designers find a personal voice so that their pieces ring true and when imitated are merely derivative and don’t quite resonate. I have found my particular mojo and motifs and am very comfortable exploring and expressing them. It can get lonely in this niche so I love it when I find someone—like Lynne Barr--whose work is awesome, someone who makes me say, “I wish I thought of that!” I have felt encouraged by several of my colleagues and I hope that I have also encouraged them. On the flip side, it can be a bit annoying to see someone has imitated me without a reference to the source, but at the same time I am proud to see my influence on the knitting world and that some of the garments I did that were once seen as shocking or wacky such as cowls or chain link garlands are now more mainstream and almost a genre unto themselves. I think we’ve moved beyond dumbing down. 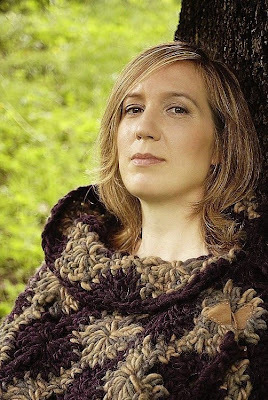 While much of my work used to focus on simple shapes and quick large gauge knits for the new wave of knitters, my audience has matured and I love pushing the limits of the craft with more complex techniques, finer gauges and full fashioning. The online community has been a great resource and prodded knitters to master new skills. Avid sock knitters have surpassed the novice scarf knitters that yarn shops used to cater to. I think there is a different attitude towards pattern reading now. Elizabeth Zimmermann’s books have helped to create thoughtful and fearless knitters who are now becoming designers. It is a great time for knitting. I knit about half of my samples and send the other half to sample knitters both locally and as far away as Holland. I’d have to count but I probably designed 50 pieces in 2009 and knit 20-25 myself and about 11 ladies knit 1-3 apiece for me. I should put it all on one spreadsheet or something, but I’m too busy. There’s nothing I would rather do than knit for hours listening to NPR, audio books and music—I’m a compulsive and fast knitter and need my fix. Knitting a good portion of my designs allows me this and cuts the costs of samples. And sometimes there are design decisions I make on the needles and on the dress form. I often do the finishing on the pieces to give them the final touches. Not a formal one, but when I started my website I did write about my vision for my line, surveyed the market, and figured out pricing, etc. I also have written several book proposals, which actually are similar to a business plan, and a proposal for my yarn line. I actually have a certificate in Entrepreneurship (along with a B.A. in English Lit). And as a journalist, before becoming a hand knit designer, I covered business aspects of the fashion industry for a trade report. I interviewed accessory designers about their companies—some of them who have gone on to be phenomenal successes, such as Kate Spade—and this was very inspiring. I have been fortunate to have many mentors. One of my first jobs in the fashion industry was with Lisa Bruno who taught me about trend forecasting. I worked for Trisha Malcolm at Vogue Knitting who took a chance on me and encouraged me, and while there I met practically everyone in the business. Then I was “discovered” by Melanie Falick who is the best at what she does, making books. Pam Allen was also very supportive of my career when she was at the helm of Interweave Knits. And more recently I have learned about the yarn industry from Stacy Charles and Diane Friedman of Tahki where I also enjoyed working with Nancy Thomas during my first few seasons. My business has had many incarnations. When I started my first website with kits and patterns there were not so many web-based knitting businesses. The landscape has changed, and now I have a yarn line and distributor (Tahki Stacy Charles) and no longer sell all my patterns directly—and beginning next week I also will be selling my pattern collection through Interweave Knits website (these are not designs published in the magazine, but exclusive-patterns). I am investigating other avenues for the future such as once again producing a small line or doing custom sweaters from my designs. Breaking into Ready To Wear is very difficult and when I launched a line for boutique sales I lost money. 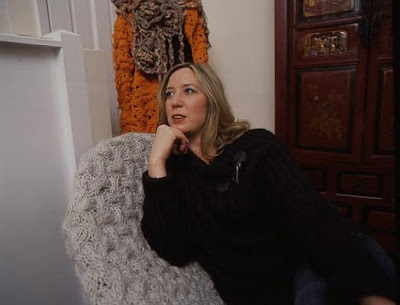 I have designed private label knits for Ready To Wear designers, such as Shelly Steffee who now has an awesome boutique in the meatpacking district, and tried to soak up their expertise. Oh yeah, and about 10 years ago, I designed knits for a line by Stacy London of “What Not To Wear” who began as a fashion editor is is now an Oprah favorite, mini-media mogul and Pantene spokes model. Having known people with such extreme career ascendance, helps me to believe anything is possible, and I myself could be a Martha Stewart one day (not that I would want all the attention). One craft maven whose career I’d like to emulate is Erica Wilson. She had a PBS show on textiles and was at her most popular in the late 1970s. I admire that she bridged the gap between fine art and craft, her needlework kits were in museum shops—I would like to penetrate that market myself. The Tech Editor comes in after I have typed my version of the pattern and works her magic to clarify and correct it and create charts and schematics from those I’ve penciled in on graph paper. One of my goals this year is to get the software to input the charts myself. But then again I wish I could just have all my fabulous ideas (like the lace peacocks I imagine touching beaks to form a belt on the front of an Edwardian/art nouveau coat) instantly turned into a finished pattern. Unfortunately, the craft publishing isn’t like Seventh Avenue where there are teams at your disposal to implement one’s vision. Balance? Working from home means there are not traditional boundaries of work/life. But this is also a benefit as I’m a single mother. I have a studio in my home but my work is also carried to other rooms and out to my daughter’s activities and done at all hours. It is an integrated, multi-tasking life where work spills over into life and vice versa. It’s a business of time-intensive handwork where there is often a race to the deadline of a photo shoot or trade show. Even with the best planning and lots of help there is inevitably a project that needs my attention and lots of finishing at the last minute. As I get older the all-nighters have become harder to pull. Taking care of my health and having a more balanced life is a higher priority. My daughter lets me know if I’m too wrapped up in my work and demands my attention and so does the house I recently gut renovated as there is always something still in need of fixing. I have been getting involved more and more in my community and local politics. A friend who has a gallery has been co-hosting monthly potluck dinners at my place so that local artists and creative parents can meet and try to further the renaissance of this marginal, urban neighborhood of Victorian homes. Eventually I hope to teach knitting seminars or from my home. I think you have to have a sense of humor. Remember the site You Knit What? I enjoyed laughing at it even if I was put on the hot seat a few times. My work seems to be particularly controversial—there are extreme positive and extreme negative reviews on Amazon. The photo styling in my books seems to bring out the Love/Hate. The knitting world has a disconnect from the fashion world--my photo styling is mild compared to high fashion editorials. Also I have used both professional models and dancers, artists, musician friends of mine of all ages, ethnicities and sexual orientation. I am very into the shoots and see my books as a cinematic, poetic fantasy world of knitterly delights. Chacun a son gout, and my work is not for everyone. But I myself buy all sorts of knitting books and am saddened when knitters are close-minded and stingy and count each pattern they might knit to decide whether to buy a book. I treasure books for inspiration, and lessons, as they are always a bargain compared to the cost of tuition and other things in daily life. Criticism can be hurtful, especially when the knitter is vehement and misinformed and has a really big soapbox to stand on, but I think most people can discern when the reviewers have a biased agenda. Some knit bloggers are talented writers, extremely funny or have that “it” factor so that everything they touch in their garden, kitchen and on their needles appears delectable. However, other bloggers seem truly ordinary, bogged down in pettiness and lacking in imagination, yet knitters flock to these blogs perhaps as a kind of reassurance of mediocrity and applaud items that would never pass professional standards. I may get flak for venting, but some bloggers have written insulting things about my work without any remorse—they usually have “grump” or “curmudgeon” in their name and personalities to fit. So it does bother me when such a blogger decides to knit my design (even though she is surprised that she actually likes something of mine, again) and then she declares that her version (tamed of the intentional ripple of character and in a much too tight gauge) is better than that pictured in the magazine and tries to get everyone to agree. I try to avoid seeing such posts but inevitably someone brings them to my attention. Sizing is definitely a hot button issue. I personally did not create the fashion industry standards—most retailers don’t go past size 16. It is true that most knitters are plus size and the industry is finally responding to this. However, I do think there is a bit of unnecessary bullying going on that is directed at publications that don’t size up past 46” or 48” chest. I find it offensive that some knitters have gone through my first book and looked at the chest measurements (some of which have negative ease) and dismissed the whole thing as “for anorexics”—the models are actually quite diverse, some as thin as in other knitting magazines are several who happen to be plus size. I believe beauty comes in all sizes, shapes, ages and colors and shines from within—sometimes ugly is beauty--and I try to evoke this. At the same time, we all know that obesity is a concern. I find the “sizing issue” hostility that’s directed towards knitting designers and publications misplaced and disrespectful—would the same person attack the doctor’s scale and chart? The bottom line is we all should strive to be healthy. I love the British show where they make an underweight and overweight person live together and eat each other’s meals. As a culture we are totally obsessed with weight and need to find balance and health for the sake of the next generation. My career has gone through various phases. I am thankful to have a secure footing and good name in the industry and like my colleagues whom I’ve seen donning various hats for various magazines and yarn companies, I feel that I can always find a place in it. I began with a salaried position at Vogue Knitting (when it was owned by Butterick) and as you may know the lower and mid-level editorial and fashion “glamour” jobs aren’t really a good living, not for the high cost of living in Manhattan. I think these jobs are traditionally female and it is assumed that women have a husband or trust fund. My first online business of kits and patterns did well but but only just matched my editorial salary, plus when I tried to break into boutique sales I sank a large investment and ran out of money to continue. It hasn’t been easy--there have been times when I have relied on financial help from my daughter’s father and my parents, times when I’ve had to take on non-knitting related writing, editorial and proofreading work. Fortunately about three years after leaving VK, I got a book deal and I’m now working on my third book and have my yarn line through Tahki Stacy Charles. I have bought and rehabbed a large townhouse in a transitional neighborhood of Jersey City, just across from Manhattan, and am now have a sideline as a landlady. My tenants are a Montessori teacher and a talented designer/mother of three who is freelancing at Anne Taylor Loft. In order to make an income at this you have to do a great number of projects. You should have your work distributed to various venues—some self-published ones that will get you a bigger piece of the pattern price, some which will get you royalties that will come in over time, and some projects for a modest one-time lump sum such as contributing a piece to another author’s book. Seek mentors. Try to foster relationships with publishers and other designers and be supportive even if you are competitors. Value your connections and keep doors open, as you never know when you will be working with someone at a later date. Try to learn from every experience, but look inward and find your own voice. Know what makes you special. Never lose your love of knitting and if you fear yo u are going to lose it, then change what you’re doing.